It’s been a bitter-sweet week for blogging. The reason being is that I have a lot of fresh veg to use up straight from my garden but unfortunately as we have planned to go on holiday sometime soon, I have no spare time to fit in any YouTube recipes and need to use everything up to prevent waste. It’ll be sad to leave the garden to what may be a caterpillar’s feast, but I cannot tell you how excited I am to go away in our camper van too. We’re talking sand between the toes, splashing in the sea and lots of camping food and dog walks. What I can offer you however are random recipe inventions that have had no influence from any website or recipe book around. I do love going with the flow but it can be risky and on this occasion, I learnt it wasn’t soup maker friendly but was still a delight to use up the food I grew myself, being in this case, the courgettes and basil in an old fashion pan, hob and blender. 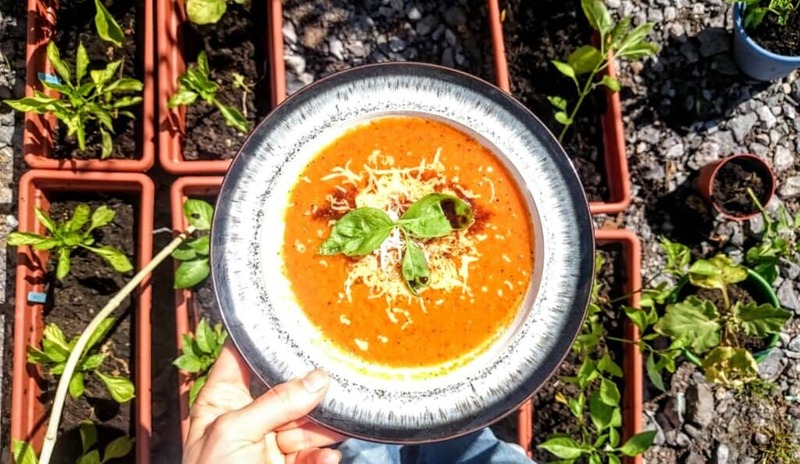 This recipe is a yummy italianesque farmhouse or allotment style soup and the key here is to roast the vegetables, drawing out all of the moisture, leaving a richer taste with natural sugars. The longer you leave it, the better it will taste. *Note that I used a tin of tomatoes as my tomato plants are not ready yet, but what would be even better if you roasted fresh ones instead. Put your oven on gas mark 6. Now chuck all the chopped veg in a large roasting dish apart from the broccoli, basil and tin tomatoes (note it will be fine to add halved fresh tomatoes). Now add the seasoning and spritz with oil spray and roast for a minimum of 30 minutes but no longer than an hour. Now transfer all the veg to a large sauce pan and discard the garlic peel and add everything else in apart from the topping section in bold and simmer for 20-25 minutes then blend. Once cooked, stir in the basil and serve each soup with some grated low fat cheese from your healthy extra allowance, a drizzle of vinegar and spritz with low calorie extra virgin olive oil. I hope you love this bowl of health and that you have a great harvest if you are growing your own veggies this year.